POOR finishing cost Dumbarton a second victory over Hamilton Accies at New Douglas Park, with the home side eventually winning a very close encounter 2-1. 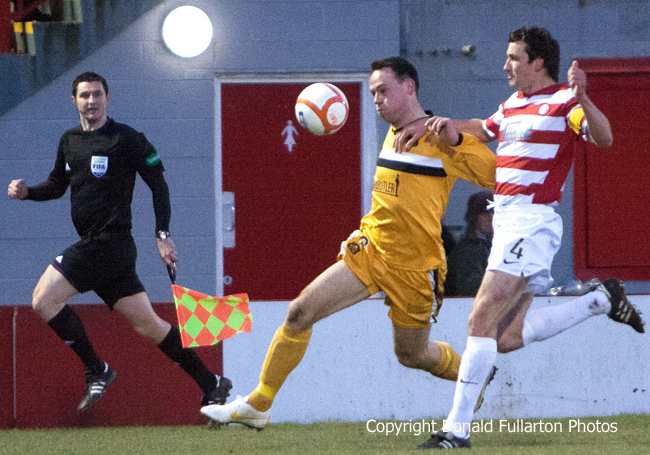 POOR finishing cost Dumbarton a second victory over Hamilton Accies on a chilly evening at New Douglas Park, with the home side eventually winning a very close encounter 2-1. Ian Murray's men were hoping to repeat Saturday's win at the same venue, and for a long time it looked as if they would. Jim Lister opened the scoring early in the first half with his 14th of the season, a looping header over the keeper, and Sons dominated the rest of the first half. Bryan Prunty missed two good chances, one from close range in front of goal, the other an overhead kick from a narrow angle which went over the bar, and Scott Agnew was another who came close but could not beat the keeper. With Ian Murray sent to the stand shortly before half-time by referee Craig Charleston for protesting against a booking for Alan Lithgow, who had replaced the injured Paul McGinn, it was former Scotland keeper Craig Gordon and youth development chief Tony Gervaise who were in charge in the technical area after the break. The second half was a real battle, with full-time Accies coming more and more into the game, despite interruptions and bookings from the whistle-happy ref. Their pressure eventually paid off with two goals from ace striker Stevie May. Sons tried hard for a second goal, but found the home keeper in top form. The picture shows Jim Lister breaking down the right wing.